Last September, we embarked from Shanghai on a 17-day cruise that made port at Nagasaki, Japan; Busan, South Korea; Taipei, Taiwan; Hong Kong; Vietnam; Bangkok, Thailand; and finally Singapore. My story (with photos) of the journey is featured in the Spring issue of TravelWorld International magazine, starting on page 6. http://issuu.com/travelworld/docs/_twi_magazine_spring_2015/1. Please enjoy the tour. In 1956, actor Yul Brynner, as the king of Siam, sang and danced through a gilded palace in the movie, “The King and I.” The country of Siam has since changed its name to Thailand, but its Grand Palace in Bangkok is still something to sing about. The older Thai capital at Ayutthaya in the North had been destroyed in 1767 during a war with Burma, and newly proclaimed King Rama I ordered his men to remove bricks and other materials from the forts, walls and palaces (but not the temples) of this ruined city and send them by barge down the Chao Phraya river to the new capital city of Bangkok. Not only was he updating his wooden palace, but to solidify fortifications around his riverside capital, Rama I dug canals along its eastern edge, turning the city into an artificial island. The Grand Palace is not one large structure in the tradition of most European palaces. It’s divided into four main courts separated by walls and gates and originally housing royal offices, state ministries, the royal chapel, Temple of the Emerald Buddha, ceremonial throne halls, and the king’s harem quarters. After a second expansion during the reign of Rama II, the palace covered an area of 2,351,000 square feet and was Thailand’s administrative and religious center, with thousands of inhabitants including guardsmen, servants, concubines, princesses, ministers and courtiers. And just like Rome’s Vatican City, the Grand Palace was considered a city within a city, subject to its own set of laws. Gradually the government ministries grew in size and moved to other locations. The King, too, relocated to more modern palaces. In 1932, a student-launched revolution overthrew the absolute monarchy of King Rama VII, replacing it with a constitutional monarchy. Today, the Grand Palace still serves as a royal ceremonial venue, as well as a museum and tourist attraction. 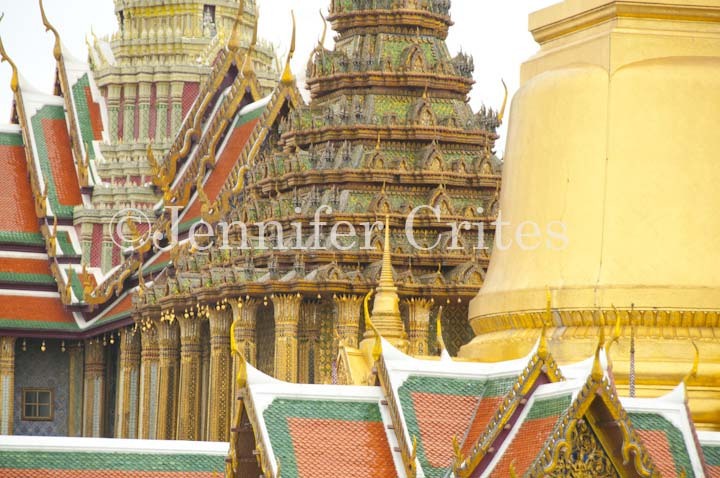 I found the Grand Palace to be a photographer’s eye-candy wonderland rife with golden temples; bejeweled pavilions; and giant, elaborately painted warriors. I’d love to return, without having to follow a tour guide, and get lost in the visual magic of it all. Have you been to Bangkok’s Grand Palace? If so, what were your impressions? 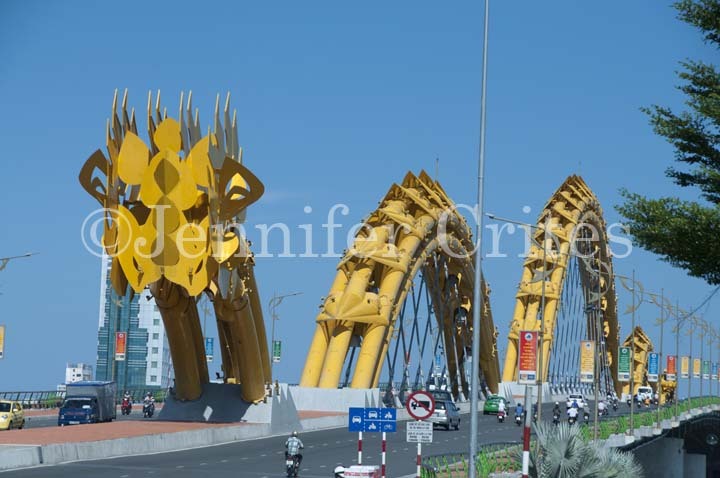 Rong Gao (Dragon Bridge), Da Nang, Vietnam. Built in 2013 and designed by U.S. engineers, this dragon breathes fire and hissing smoke (water mist) each weekend after sunset. Now that I’ve photographed it during the day, returning at night is on my Bucket List. 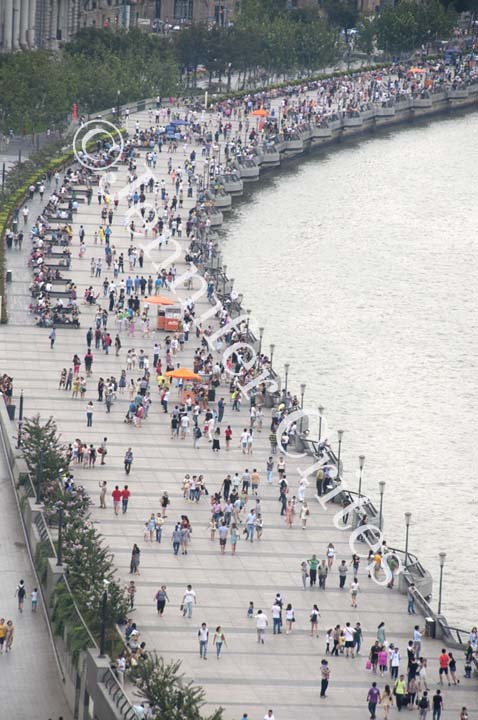 It’s a tall, tall world in the district of Shanghai known as Pudong. A mere twenty-one years ago, Pudong—on the eastern shore of the Huangpu River, opposite the city’s celebrated Bund—was a mix of farmland, squatters’ shacks and swamp. Now it has a population of more than five million and is home to some cloud-scrapers even Superman would have to think twice about leaping over in a single bound. As these behemoths neared completion, Shanghai residents gave them nicknames. Designed by architects in Chicago, the Jin Mao Tower has a pointy top that looks like those needles you stick into eggs that whisk them from inside the shell. Some call it the Egg Beater, others the Marinade Injector or Syringe. As a business center and home to the Grand Hyatt Shanghai hotel, it stands at 1380 feet or 88 stories high. For an entrance fee, you can shoot up at thirty feet per second to the top floor observation deck along with 999 other like-minded people for a stunning view. Once the tallest structure in China from 1994 to 2007, the Oriental Pearl TV Tower at 1,535 feet (387-foot broadcast antenna included) is no longer the tallest, but definitely the most unique. Its eleven spheres, fifteen observation levels, and three gigantic columns host a combination of exhibition facilities, restaurants, shopping mall and hotel. The highest observation deck, at 1148 feet, is known as the Space Module and has an outside area with glass floor. Its architects designed it to resemble two dragons playing with pearls. It’s called, simply, the Pearl Tower. Next up is the Shanghai World Financial Center. It’s a sleek, modern beauty at 1,614 feet (101 floors), the glass-and-metal façade reflecting sky and clouds. It, too, has a sightseeing top floor and can survive a devastating magnitude-8 earthquake (good to know if you’re sightseeing on that top floor when the earth shakes). With its distinctive trapezoid hole near the top, it’s easy to see why it garnered the nickname, Bottle Opener. 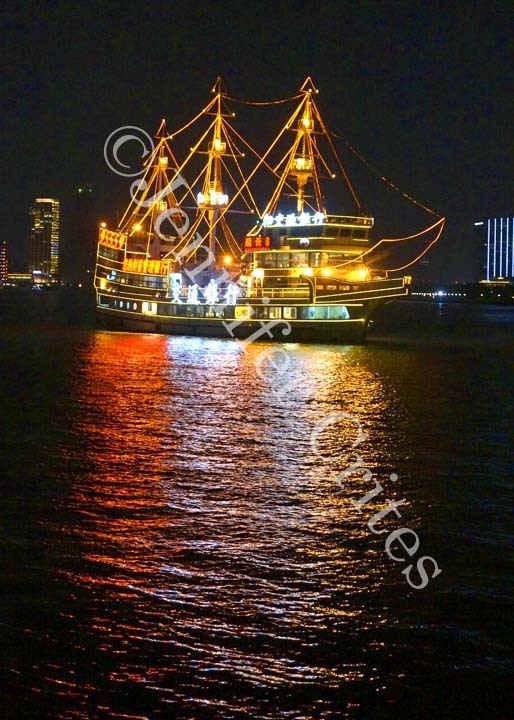 A brightly lit, masted brig sails up and down the Huangpu River in front of the Bund and Pudong. And at the top of the heap, so to speak, is the almost-finished Shanghai Tower. When completed in 2015, it will stand 2,073-feet high, with five basement levels, 121 floors above ground and five podium floors, and it will be, not only China’s tallest building, but also the second tallest in the world (Dubai’s Burj Khalifa is taller). 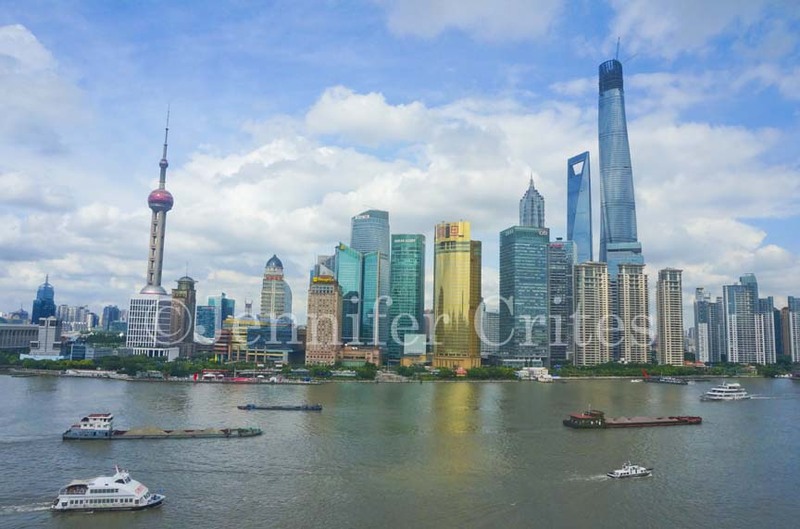 Since Shanghai is on a seismic belt, engineers poured a twenty-foot-thick underground baseboard over almost a thousand 282-foot-deep foundation piles to ensure stability. And, since Shanghai is also subject to frequent typhoons, they designed the building to twist about one degree per floor to offset high winds. The building spirals upwards like a snake climbing a tree. Because of its twist, it’s called the Screwdriver. Or sometimes the Egg Whisk. 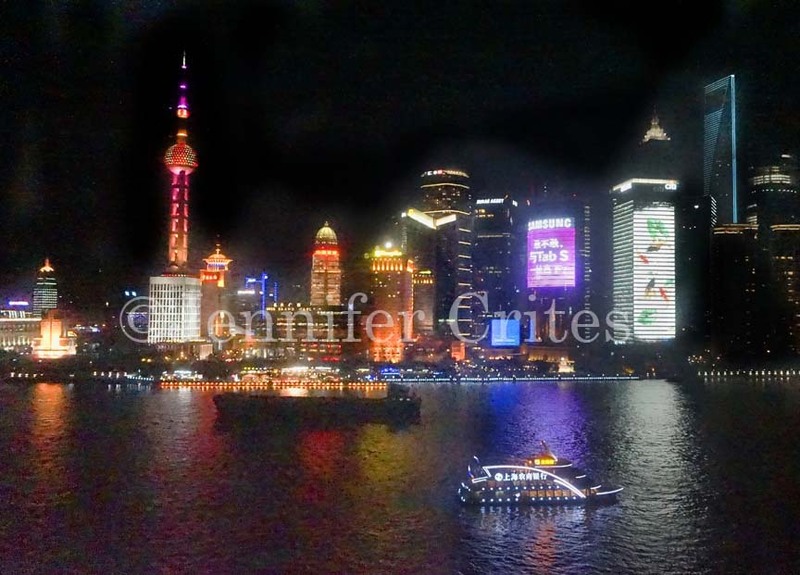 These buildings and many others in Pudong draw attention to themselves in the evening by switching on an incredible, constantly changing and colorful LED lightshow. 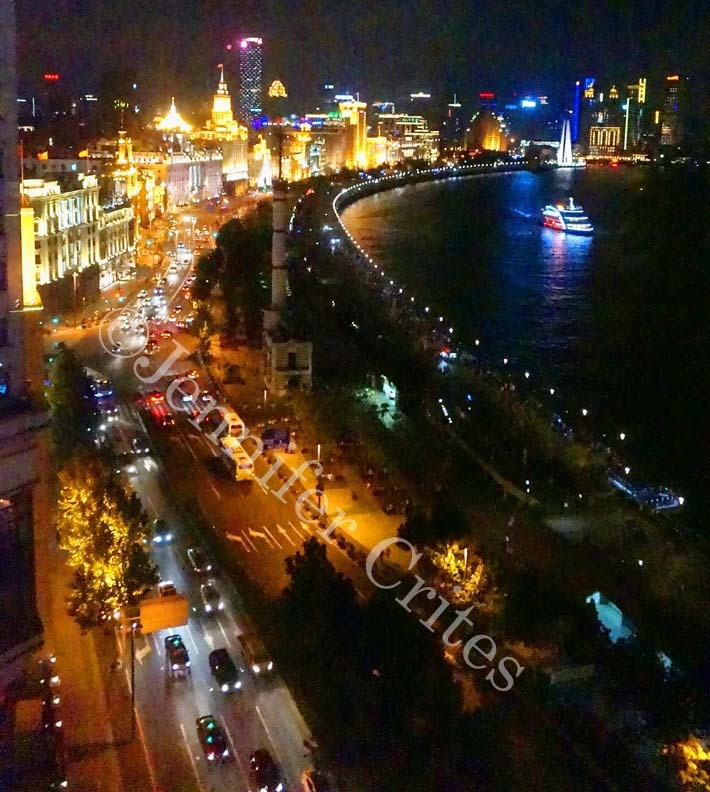 I admit to sitting by my Bund hotel-room window after dark and watching, fascinated, as the lighting display created a mesmerizing backdrop for the barges, ferries and sightseeing boats plying the river. One night, a flash storm added lightening to the mix. It was much better than tv. 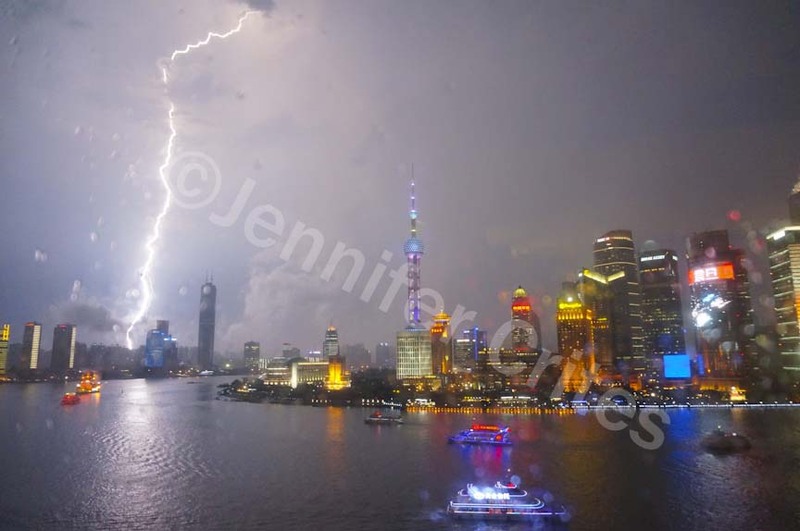 Lightening splits the sky over Pudong during a brief evening rain storm. The Pearl Tower with its bulbous spheres is easy to spot, but can you pick out the Egg Beater, Bottle Opener and Screwdriver? Hint: at night, the unfinished and lightless Screwdriver disappears in the blackness. Yu Gardens bridge, pavilion and lake. The most delightful maze in the world is not a maze—it’s a 5-acre plot of tranquility in Shanghai’s Old Town. But once you pay your entrance fee and step inside Yu Gardens, it’s easy to get hopelessly turned around amid the tapestry of winding walkways, caves, red pavilions, carp-filled lakes, stone bridges, whimsical doorways and myriad artful rock formations (which I suspect are feng shui inspired). “Haven’t we been to this spot before,” I asked my husband more than once as we wandered around gawking at the aforementioned sights, and peering through different-shaped openings that framed the garden’s treasures. 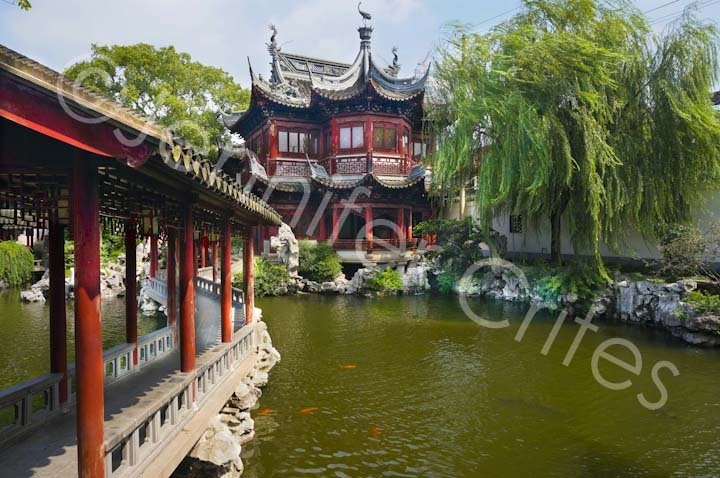 The largest and most prestigious of its era in Shanghai, Yu Gardens was built in fits and starts during the Ming Dynasty between 1559 and 1577 by Pan Yunduan as a peaceful place for his aged father. It was first opened to the general public in 1780. Despite damage during the First Opium War, Taiping Rebellion, and in 1942 by the Japanese, it was repaired by the Shanghai government and declared a national monument in 1982. Don’t expect orchids and other floral arrays here, but if you’re ever in Shanghai, Yu Gardens is a must-see. Be sure to go when it first opens to get ahead of the tour busses. If you’d like to wander with me through this enchanting garden. just click on any photo to start the visual tour. But, as the sign says, “Be Careful,” because here there be dragons. One of many decorative and creatively shaped archways. Decorative flooring. Here art is everywhere. A brief respite. Following a photographer around is hard work. Stones are arranged to resemble ripples as the boat moves through water. Sign at entrance to a cave. Be careful not to hit your heads on the protruding rocks. A dragon’s snakelike body ripples across the top of a wall. Boat House. Stones are arranged to resemble ripples as the boat moves through water.